There is so much hype about the Nordstrom Sale and it’s early access. Well, I don’t have early access and last time everything I wanted sold out by the time I had access to it. I will be checking the sales out though because there are some great deals and it’s a great excuse to shop! We all love sales and I was in Anthropologie the other day and bought a few things from their sale section and wanted a lot more. 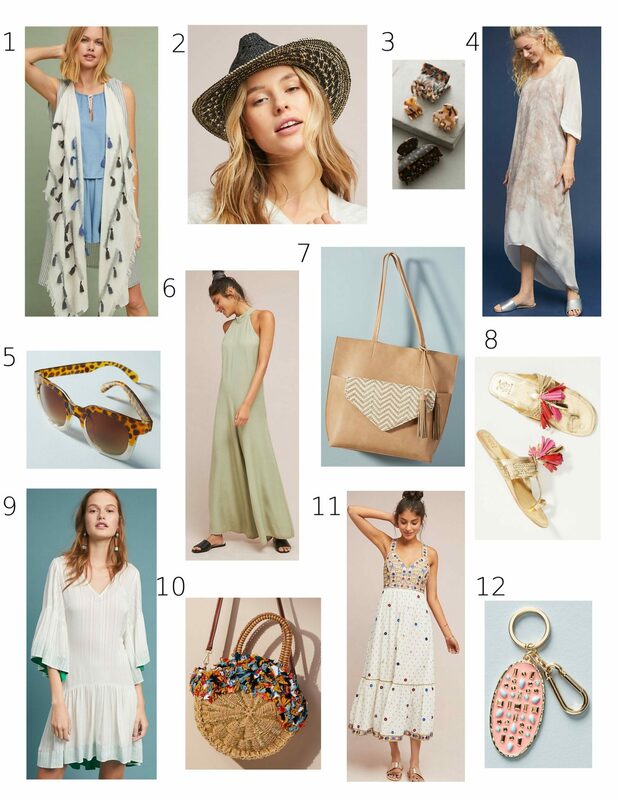 I looked online and there are even more adorable items so I decided to put my top Anthropologie sale items together for you! I purchased this hat (2) and I love it but since it was on sale I feel like there is something wrong with it that i’m unaware of. I also saw this kimono (1) but didn’t realize how cute it was until seeing it on the model online, now I want to go back and get it. I feel like it would be a great breezy item to toss on over a bathing suit. I also got these hair clips (3) and this beautiful dress (4). This dress may not be the most flattering but the tiedye is subtle and that material is really nice, plus it has pockets! This tan bag comes in black and has a removable clutch, the black one I saw in person and thought about getting but I actually like this tan one better and might order it online. Speaking of bags, are you guys over the rattan bag trend? I currently don’t own one bag because every other person has one but I do think they are great for summer and a cross body, like this one (10), allows you to be hands free. I saw this fun dress (11) in the store too but they only had a large. I might have to order it online because I love how it looks on the model and feel I should own it. I also treated myself to this keychain (12) because I don’t have a keychain at the moment and its kinda fun to dress up your keys.